Host-parasite coevolution can result in balancing selection, which maintains genetic variation in the susceptibility of hosts to parasites. It has been suggested that variation in a thioester-containing protein called TEP1 (AGAP010815) may alter the ability of Anopheles mosquitoes to transmit Plasmodium parasites, and high divergence between alleles of this gene suggests the possible action of long-term balancing selection. We studied whether TEP1 is a case of an ancient balanced polymorphism in an animal immune system. We found evidence that the high divergence between TEP1 alleles is the product of genetic exchange between TEP1 and other TEP loci, i.e. gene conversion. Additionally, some TEP1 alleles showed unexpectedly low variability. The TEP1 gene appears to be a chimera produced from at least two other TEP loci, and the divergence between TEP1 alleles is probably not caused by long-term balancing selection, but is instead due to two independent gene conversion events from one of these other genes. Nevertheless, TEP1 still shows evidence of natural selection, in particular there appears to have been recent changes in the frequency of alleles that has diminished polymorphism within each allelic class. Although the selective force driving this dynamic was not identified, given that susceptibility to Plasmodium parasites is known to be associated with allelic variation in TEP1, these changes in allele frequencies could alter the vectoring capacity of populations. Host-parasite coevolution can take different forms. For example, coevolution can involve repeated selective sweeps, which drives divergence between species while diminishing polymorphism within species [1, 2]. Many more immune system genes show evidence of selective sweeps than genes with other functions [3, 4]. However, coevolution is also associated with balancing selection, which is of particular interest as it can maintain functionally important polymorphism within species [5–8]. Quantitative genetic studies have revealed substantial genetic variation for infection-related traits in a wide range of organisms (reviewed in ). Analyses of DNA sequence polymorphism can provide certain evidence as to whether this is due to balancing selection. For example, the action of balancing selection may be evident in allele frequency distributions or due to the fact that balancing selection promotes sequence differences between alleles [10–13]. However, phenomena such as unexpectedly deep divergence between alleles can have other origins, such as gene conversion. Analyses of the immunity genes of Anopheles gambiae, the primary mosquito vector for Plasmodium falciparum in Africa, have, for some time, lagged behind those of the model Drosophila, but this is changing. For example, RNAi knockdown studies have now identified many genes which act as antagonists of parasite development, and also genes that act as agonists protecting the parasite from mosquito immune responses . Additionally, major-effect Quantitative Trait Loci that make mosquitoes resistant to Plasmodium have been identified in natural Anopheles populations . However, although it is clear that phenotypic variation for resistance to malaria is abundant in natural A. gambiae populations [15, 16], it has not yet been precisely determined which Anopheles genes explain variation in resistance to Plasmodium (or indeed any parasite or pathogen of Anopheles). Studies of polymorphism, which can recognise the action of selection and help identify the genes that underlie phenotypic patterns of resistance, are increasing [17–20], although have not yet thrown up any clear candidate targets of parasite-mediated selection. A key immunity gene identified through functional studies on An. gambiae was a thioester-containing protein (TEP1)[21, 22]. In vertebrates, the TEP family includes the broad spectrum serine protease inhibitors α2-macroglobulins, and complement factors, which are involved in the labeling and destruction of pathogens. Fifteen TEPs have been identified in the An. gambiae genome, and some, including TEP1, are up-regulated upon infection with Plasmodium bergei , a cause of rodent malaria commonly used as model for the study of human malaria . TEP1 is secreted by mosquito hemocytes into the hemolymph, where it is cleaved after septic injury and then binds to pathogen surfaces through the thioester bond. Through this activity, TEP1 may be one of the factors that determine vectorial capacity in An. gambiae. The knockdown of TEP1 in a susceptible strain resulted in a five-fold increase in the number of P. bergei oocysts developing in the midgut, while in a resistant strain of mosquito, the knockdown abolished parasite melanisation, thus rendering mosquitoes susceptible . These susceptible and resistant laboratory mosquito strains possess different alleles at TEP1 (TEP1s and TEP1r, originally labeled in the genome annotation as different genes, TEP1 and TEP16), but it is unknown if this variation causes the observed differences in resistance. Intriguingly, however, the identity between the TEP1s and TEP1r deduced amino acid sequences is less than 90% in some regions, including the functional domain that contains many of the key features of the molecule [23, 25]. This similarity is exceptionally low for alleles at a single locus, and suggests that the two allelic classes at TEP1 are much more ancient than alleles at other loci in An. gambiae (or indeed in the majority of animal taxa), as can occur through balancing selection. This study therefore investigated the possibility of balancing selection at TEP1 by gathering DNA polymorphism data in African populations of An. gambiae. Our data provide a rigorous statistical test for the anecdotal observation that the TEP1 locus harbours unusually divergent alleles. We also find evidence of recent selection affecting allelic frequency. However, our data also make it clear that genetic exchange has occurred between the TEP family members, potentially making it difficult to distinguish the effects of selection from those of gene-conversion. Indeed, in the case of TEP1, the latter is a more compelling explanation for the deep divergence of alleles at TEP1. Alignments between the coding sequences of TEP1 (AGAP010815) and TEP's 5 and 6 (annotated as TEP17 (AGAP010814) and TEP18 (AGAP010813) respectively in Ensembl release 49, March 2008) clearly show the level of divergence between loci is not consistent along the length of the gene (Figure 1). Specifically, divergence (K s : the number of synonymous substitutions per synonymous site) between TEP1 and TEP5 or TEP6 varies from K S >1 in some regions (i.e. higher than can be reliably estimated using a simple model of substitution) to K S ~0.03 in others (on a par with typical divergence between alleles). This suggests that different parts of the gene may have experienced different evolutionary histories. In particular, TEP1 appears to be a chimera of a TEP5-like gene (Figure 1C; ca 1 – 1.5 Kbp) and a TEP6-like gene (Figure 1B; ca. 2 – 3.2 Kbp). Consistent with this, the MaxChi test  identifies four regions of TEP1 that show significant evidence of recombination with TEP5 and/or TEP6 (recombination breakpoints shown as grey boxes, Figure 1). Across the region of high divergence between TEP1s and TEP1r (Figure 1D; from site 2100 to the 3' end of the coding DNA sequence) both alleles show high similarity to TEP6 (Figure 1B). However, TEP1r is consistently more similar to TEP6 than is TEP1s (red vs. blue lines, Figure 1B). Indeed, all haplotypes in the TEP1r class share a region of ca. 320 bp within the TED domain (Figure S1) that shows significant evidence of recombination with TEP6. Divergence (all sites) between TEP1r and TEP6 in this region is only 3.2% (95% bounds by simulation 1.2–5.5% using K-estimator) but divergence between TEP1s and TEP6 is three times larger, at 14.6% (10.4–19.5%). This suggests a more recent shared ancestry for the TEP1r and TEP6 sequences in this region. Thus, although TEP1 appears to be a TEP5/TEP6 chimera due to gene conversion, it seems that conversion events with TEP6 have occurred more recently for the TEP1r allele than they have for the TEP1s allele. For a very small minority of individuals for which we sequenced the TED domain appeared to be a recombinant between TEP1r and an unidentified TEP6-like gene (Figure S2, lower panel). This suggests gene conversion into TEP1 from yet another locus. Although the high divergence between TEP1s and TEP1r suggests that recombination between them is rare, if the sequences are allelic then some evidence of recombination might be expected. Within the region where TEP1s and TEP1r are highly divergent, we identified six recombinant sequences between the two allelic classes (Figure S2, Genbank Accessions EU881745–EU881867), although all but one of the recombinants were at low frequency. Divergence between TEP1s and TEP1r alleles. The proportion of sites that differ between the TEP1s and TEP1r alleles are plotted against position for all silent sites, synonymous sites, and non-synonymous sites). Genomic sequence spanned by the macroglobulin domains 1–8 (MG), a linker (LNK), a β-sheet and the thioester-containing domain (TED) are marked below the x-axis. Also marked are exons (solid black bars) and a region of putative gene conversion from TEP6 (grey bar, see main text for details). For zero to 5 kbp, 14 TEP1s and 15 TEP1r haplotypes were used; for 5 kbp to end, 6 TEP1s and 5 TEP1r haplotypes were used. 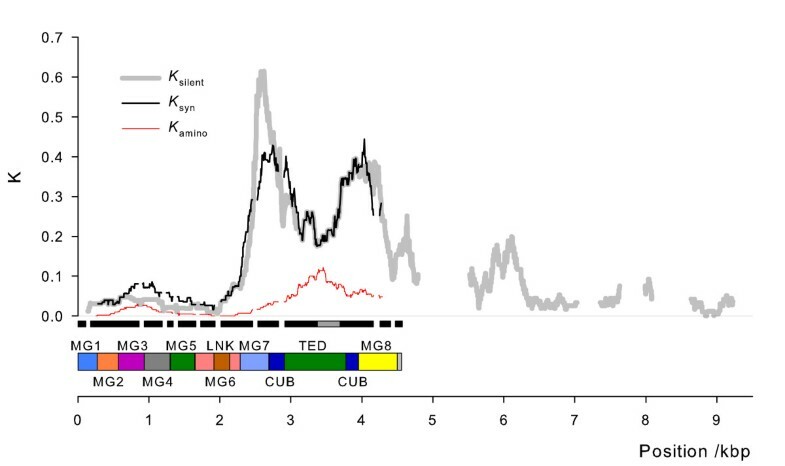 Moving windows were 100-site for silent and synonymous sites, 300-site for non-synonymous sites and gaps in K silent correspond to regions with large indels and/or no discernable alignment between TEP1s and TEP1r haplotypes. Our results confirm that overall genetic diversity in TEP1 is high (π S > 10% for An. gambiae 'Mbita', Table 1), and that amino acid diversity is exceptionally high (π A ~4%, Table 1). As described previously [23, 25], high diversity in TEP1 results from co-occurrence of the divergent TEP1s and TEP1r allelic classes, and that amino acid differences between the two allelic classes are likely to cause functional differences (see also Figure S3, additional file 1). 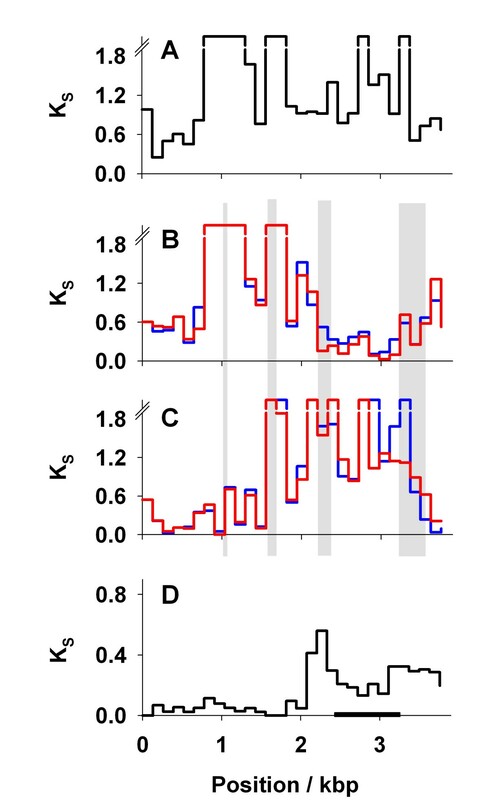 Our data additionally show that the region of high divergence covers the 3' half of the coding sequence and extends almost 2 Kbp into 3' flanking DNA (Figure 2). 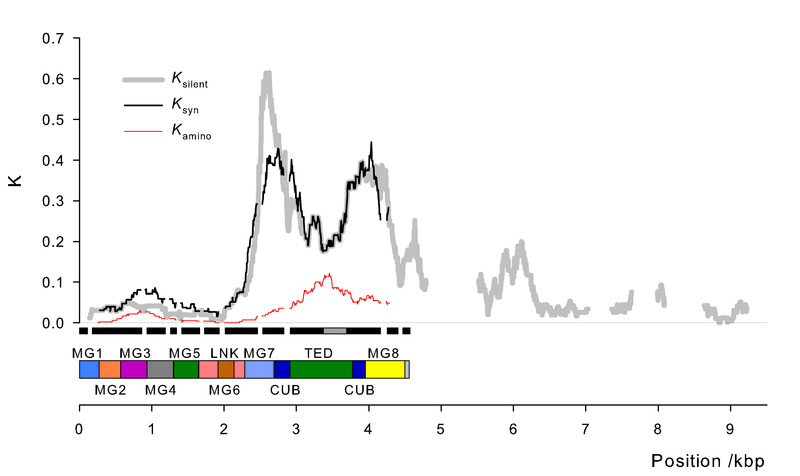 Silent site divergence (K S ) between these allelic classes exceeds 40% in some places, and is approximately 20% in the TED domain, where amino acid divergence (K A ) reaches >10% (Figure 2). The co-occurrence of these highly divergent allelic classes gives a significantly positive Tajima's D statistic (Table 1) and results in unusual haplotype structure (Table 2): given the number of segregating sites, there are significantly too few haplotypes and a most-common haplotype that is significantly too common. Thus, the distribution of genetic diversity between the TEP1s and TEP1r allelic classes is incompatible with a standard neutral model of molecular evolution. n is the number of haplotypes sequenced, S the number of segregating sites, θ Watterson's estimate of 4 Nμ per gene, K the number of haplotypes, M the frequency of the commonest haplotype. The 'Haplotype Configuration' is a vector (n1, n2, n3, ..., ni) giving the number of distinct haplotypes that appeared i times in the sample (see Innan et al 2005). For example, the first haplotype configuration (4,1,0,0,0,1,1,...) has four haplotypes that appeared once each, one that appear twice, none that appeared three, four or five times, one that appeared six times and one that appeared seven times. aSampling was not at random with respect to s/r state, bsignificance not tested. Significance assessed through coalescent simulation is indicated as *p < 0.05, ***p < 0.001. Within the divergent allelic classes (treated separately), genetic diversity is low (π S ~1%, Table 1) – closer to that displayed by other An. gambiae loci  – and neither Tajima's D statistic (Table 1) nor the haplotype configuration statistics (Table 2) identify any significant deviation from neutrality. However, it is notable that genetic diversity is consistently lower and Tajima's D (non-significantly) more negative for TEP1r than TEP1s, suggestive of a smaller long-term effective population size and a recent increase in frequency for TEP1r. Most strikingly, in the Cameroon sample, the TEP1s allelic class displays normal genetic diversity (π S = 1.6%) but there is no variation at all amongst the TEP1s/r putatively recombinant sequences. Using a McDonald-Kreitman test, we found that there was a significant excess of amino-acid difference between the TEP1s and TEP1r relative to the levels of polymorphism (Table 3). This suggests that natural selection has driven the adaptive divergence of the protein sequences of the two alleles. Next we tested whether natural selection has changed the frequency of the two alleles relative to each other. Under the null hypothesis that their frequency has been constant through time, the genetic diversity within each allelic class will be proportional to its frequency in the population. However, we found significantly reduced genetic diversity among both the TEP1r alleles of An. arabiensis, and in the TEP1s/r recombinant alleles from the Cameroon population of An. gambiae (Table 4). This suggests there has been a recent increase in the frequency of these alleles in these populations, although we cannot with certainty attribute this to selection, rather than a demographic effect. McDonald and Kreitman tests of whether natural selection has driven the divergence of the TEP1s and TEP1r protein sequences. Test for a recent change in allelic frequency based on the distribution of segregating sites between allelic classes. The An. gambiae immunity gene TEP1 is exceptionally polymorphic in a region than includes the key functional features of the protein, and patterns of diversity are incompatible with a neutral model of evolution (see also ). Localised amino acid divergence (in particular at exons 7–10, Figure 2) between the TEP1 alleles ranged up ca. 10%, which is reminiscent of cases of balancing selection such as human MHC class I alleles which show up to 19% amino acid divergence between alleles . Assuming the Drosophila  synonymous substitution rate of 1× 10-8 site-1 year-1, the divergent part of the TEP1s and TEP1r coding alleles shared a common ancestry of about 15 million years ago, which is truly exceptional for alleles at a single locus. A key question then, is whether the alleles evolved their divergence in situ (presumably via balancing selection), or did the sequences diverge at separate loci, and then become allelic due to gene conversion? Our data support gene conversion between TEP1 and other loci as a likely origin for high divergence. TEP1 as a whole may be a chimera (Figure 1B and 1C) produced from TEP5-like and TEP6-like genes. The divergence between the 's' and 'r' alleles may then represent TEP1-TEP6 gene conversion at different time points. Specifically, although the entire TEP1 divergent region is remarkably like TEP6, TEP1r is more similar to TEP6 than is TEP1s, and thus TEP1r appears to have been a more recent conversion. We can roughly estimate the time since this conversion based on the observed number of segregating sites (mutations occurring since the conversion ) over the ~2.3 kbp region of allelic divergence, assuming a star shaped genealogy of each allelic class . In 10 An. gambiae individuals we observe that seven of 485 synonymous sites are variable, which (taking the Drosophila mutation rate given above) suggests they shared a common ancestor approximately 150 thousand years ago. Whatever the origins of high divergence between the TEP1s and TEP1r allelic classes, the locus still appears to be the target of natural selection. Specifically, the TEP1s/r recombinant allele has significantly reduced diversity in Cameroon, indicating that natural selection has caused it to recently increase in frequency. Indeed, this recombinant allele shows no diversity whatsoever, while this is not so for its counterpart within the same population. A similar pattern was found in An. arabiensis, where there is a significant reduction in the genetic diversity of the TEP1r allele. McDonald-Kreitman tests also revealed an excess of non-synonymous divergence between alleles , which might indicate that positive selection has driven the divergence of alleles. Other TEP genes from Drosophila and the crustacean Daphnia [32, 33] have recently been shown to evolve rapidly under positive selection. This growing body of evidence suggests that TEP genes may be key sites of host-parasite co-evolution, and are subject positive selection (which is focused in the bait-like region corresponding to the bait region of α-macrogloblins and the anaphylatoxin fragment of the complement protein C3 in vertebrates). Our Anopheles study focused on the TED-like region, but the corresponding TED-like domain in Drosophila appears to be fairly conserved, suggesting that its functional significance varies between insects, and possibly that its function may be dependent on the types of host and parasite molecules interacting. Further work on polymorphism and divergence at TEP genes seems an exceptionally promising path to gain insight into the tempo and mode of evolution at immune system genes as well as parasites strategies to overcome host defenses. In conclusion, although we find evidence that the origin of divergent TEP1 allelic classes is due to gene conversion and not balancing selection, they may still represent functionally relevant polymorphism. That natural selection has increased the frequency of one allele relative to the other suggests that there are important functional differences between alleles, although the selective force driving this change has not been identified. What ever the cause of allele frequency changes, such evolution could alter vectoring capacity, because different TEP1 alleles are established to alter susceptibility [21, 23, 27], at least to some Plasmodium species. Further functional studies of differences between TEP alleles remain desirable, in particular if the alleles could be studied in a randomized set of genetic backgrounds and if studies could include both infection-related traits and other general measures of fitness. An. gambiae individuals were collected from three sites: Mount Cameroon region (Cameroon, provided by S. Wanji, University of Buea), Burkina Faso (Koubri village (12°11'54 N; 1°23'43 W), Mbita (Suba District, Western Kenya, provided by H. M. Ferguson, University of Glasgow, UK). An. arabiensis individuals were collected from two sites: Tanzania (Ifakara, provided by H. M. Ferguson, University of Glasgow, UK) and Mbita (Suba District, Western Kenya). Species status of all specimens was verified by diagnostic PCR . We did not distinguish between M and S molecular forms of An. gambiae s.s Although differentiation between M and S molecular forms might in principle compromise parts of our analysis, there is strong evidence that differentiation is very low in this region . Genomic DNA was extracted from single mosquitoes using the QIAgen DNeasy kit (QIAgen Ltd., UK). For short fragments, PCR was performed using BioTaq (Bioline, London, UK) and for longer fragments using the Expand Long Template kit (Buffer 2; Roche Applied Science, Mannheim, Germany). Two different sequencing strategies were adopted, according to fragment length and allelic state. Firstly, for short regions comprising the Thioester Domain (TED) only, PCR products were amplified without reference to allelic class (i.e. TEP1s vs. TEP1r), and cloned using TOPO Kits (Invitrogen Ltd, Paisley, UK). At least six clones were sequenced from each PCR product to ensure both alleles were identified. Secondly, allele-specific primers for TEP1s and TEP1r were developed to allow: (1) screening for allelic class; and (2) sequencing of single haplotypes from s/r heterozygous individuals. These allele-specific primers were either paired with TED primers (giving overlapping allele-specific fragments for this domain) or, for longer fragments, with primers placed 5' in exon 2, and ca. 2.7 kb 3' from the end of the TEP1 CDS. For several individuals we were unable to amplify the ~5.5 Kb fragment, and instead used additional allele-specific primers placed ~500 bp 3' of the CDS to amplify this region in two parts. Individuals could therefore be identified as s/r heterozygotes using short amplified regions, and subsequently targeted for long allele-specific PCR and sequencing. In total we amplified 102 haplotypes covering the TED domain (0.84 Kbp), 29 covering the majority of the CDS (4.8 Kbp), and 11 haplotypes extending ~4 kb into non-coding DNA (8.7 kb)(Figure 2). Before direct sequencing of PCR products, unincorporated dNTPs and primers were removed by incubation with Exonuclease I (New England Biolabs) and Shrimp Alkaline Phosphatase (Amersham). Cloned fragments were sequenced directly from plasmids after purification with the QIAgen Plasmid Mini Kit (QIAgen Ltd., UK). Sequencing was performed in both directions using BigDye™ reagents (v3.1, Applied BioSystems) and an ABI capillary sequencer. PCR and sequencing primers for each amplified region were designed from the published genome sequence of An. gambiae  and sequences are given in additional file 1 (Table S1). All sequence chromatograms were inspected by eye to confirm the validity of variable sites, and assembled using SeqManII (DNAstar Inc., Madison USA). All sequences have been submitted to GenBank as an aligned set: sequence accession numbers span the range EU881745–EU881867. TEP1 is part of a recently expanded gene family in Anopheles mosquitoes , and occurs in close physical proximity to other TEP genes (e.g. TEP5 and TEP6, cytological band 39C on chromosome 3L). Additionally, the TEP1s and TEP1r allelic classes are known to be more divergent in some regions of the gene than others [23, 25]. These observations led us to hypothesize that gene conversion and/or recombination, either between TEP1s and TEP1r allelic classes, or between neighboring genes, may have played a role in TEP1 evolution. We therefore examined our TEP1 s/r sequences, along with genomic sequences at the neighbouring genes TEP5 and TEP6, for evidence of genetic exchange. To visually identify potential regions of exchange, we used K-estimator  to estimate genetic divergence (under the Kimura 2-parameter model) at synonymous sites between TEP5, TEP6, TEP1s, and TEP1r, in 30 consecutive blocks across the coding sequence. To examine physical distribution of genetic divergence between TEP1s and TEP1r allelic classes in more detail, and for plots of diversity and divergence using multiple alleles, we used DNAsp [38, 39] to estimate average genetic divergence in a sliding-window analysis at synonymous, non-synomymous, and non-coding sites. To statistically identify regions of genetic exchange, we used the MaxChi test  as implemented in the R statistical computing language . This test uses a sliding window analysis, focusing on a series of points along the alignment. For each focal point (window center) a chi-square statistic is calculated to compare the proportion of matching sites to the left with the proportion of matching sites to the right, such that a recombination event at the focal point would lead to a high statistic. The maximum chi-square statistic observed is a summary of the evidence for recombination at the focal point, and significance of the observed chi-square statistic is assessed by a permutation test. The processes that promote genetic exchange, such as high similarity and close physical proximity, may compromise automated genome assembly and annotation. Some of the current TEP1 gene models in the Anopheles gambiae genome may be insufficiently robust to reliably detect gene conversion and recombination. In particular, the current Ensembl assembly (Ensembl 49, March 2008) only identifies a small part of TEP6 (there labeled TEP18), and gives a large stretch of TEP5 (there labeled TEP17) as being 100% identical to TEP1 – which is highly unlikely, given normal background levels of genetic diversity. We therefore sought to obtain improved models of TEP5 and TEP6 by manually creating new assemblies from trace files generated by the on-going sequencing of the S-molecular form of An. gambiae s.s. (Ewen Kirkness, JCVI, and ) Our manually-curated assemblies for these two genes have are supplied in additional file 1 (Figure S4), and identifiers for the trace files used are given in additional file 1 (Table S2). Hereafter, we refer to TEP5 and TEP6 as we have derived them from the S-form traces. Note that although our inference of 1:1 correspondence between our 'TEP5' and 'TEP6' sequences and those currently annotated in the genome may prove incorrect (e.g. as more informative genomic and expression data become available), this does not affect any inferences regarding genetic exchange. Using DNAsp we calculated total genetic diversity (π), Watterson's estimate of θ, Tajima's D , and Fu & Li's F  for synonymous sites. This was done for combined An. arabiensis data, and separately for An. gambiae samples from Mbita, Cameroon, and Burkina Faso. Statistics were calculated across all sequences, and for TEP1s and TEP1r allelic classes separately; and where sampling permitted, for two different amplified regions: (1) a short fragment covering only the TED domain (~800 bp); and (2) a longer fragment (with smaller sample size) covering the entire region of high divergence between TEP1s and TEP1r allelic classes (~2.2 Kbp). Haplotype statistics (number of haplotypes, frequency of the commonest haplotype, haplotype configuration) were calculated using DNAsp, and their probability under a neutral model of evolution assessed by coalescent simulation as implemented in Haploconfig , conservatively assuming no recombination within loci. Haplotype statistics were calculated across all sampled TEP1 alleles, and separately for the TEP1s and TEP1r allelic classes. Firstly, to test for a non-neutral rate of protein evolution we used a test directly analogous to that of McDonald and Kreitman (MK) tests , but applied to the divergence between the TEP1s and TEP1r allelic classes rather than to divergence between species. MK tests infer selection from an excess of amino acid substitution between lineages, assuming that synonymous sites are selectively neutral (or close to neutrality) and that polymorphic non-synonymous sites are close to neutrality. If the analysis is restricted to sequences that display no evidence of recombination, and if selective constraint is equal for the two allelic classes, the assumptions of the MK test are met by highly divergent groups of alleles such as TEP1s and TEP1r, and the MK test can be used to ascribe divergence between allelic classes to adaptive evolution. MK tests were performed with DNAsp. Secondly, to test for a non-neutral level of genetic diversity within the TEP1s and TEP1r allelic classes, we applied a test very similar to that of Stahl et al . Our aim was to test whether one allelic class displays significantly reduced genetic diversity compared to the other, given their relative frequencies and our sample sizes. If it does, then this suggests that this class may have recently increased in frequency relative to the other, because increases in frequency are expected to be accompanied by a loss of diversity. Following Stahl et al  we simulated independent neutral coalescent trees for each allelic class using 'ms' , according to the number of haplotypes sequenced for that class, but recording only the total tree length (in units of 4N e generations). These trees were then scaled by the estimated relative effective population size of each allelic class, based on its sampled frequency. Assuming constant effective population sizes for each allelic class, it is expected that the fraction of segregating sites seen in each sample of alleles will be proportional to the (scaled) tree size for that sample. Deviations from this expectation suggest that the allelic classes have changed in frequency relative to each other. Our approach differs from Stahl et al  in two minor ways: (1) the number of analysed haplotypes in each class can be independent of that class's frequency, since for our data the former comes partly from allele-targeted sequencing and the latter from PCR-assay; and (2), we account for the variance in estimates of class frequency associated with finite sample size by assuming the class frequency (i.e. the proportion that are TEP1r) follows a beta distribution defined by the observed numbers in each allelic class. As with similar analyses , in addition to the effect of selection, deviations from this model could be caused by demographic factors such as population size fluctuations and population admixture. Darren J Obbard, Deborah M Callister contributed equally to this work. This work was funded by Wellcome Trust Grant 073210 to TJL. FJ is funded by the Wellcome Trust and Royal Society. We thank Tovi Lehmann and two anonymous reviewers for helpful comments that improved the manuscript considerably. DJO performed all long/allele-specific PCR and sequencing, and all statistical analyses. DMC performed all other sequencing and cloning. FMJ helped design the sequencing scheme and provided advice and support for the analysis. DCS performed the structural modeling. GY helped design the overall project, and provided specimens and support during fieldwork. TJL conceived the project, and TJL and DJO wrote the manuscript with contributions from all the other authors.